Congratulations to "Calle J. ", the winner of Gwenan's giveaway. Thank you to all who participated! When I was a kid all I wanted to do was visit Disney World. At the time it seemed as if every one of my friends had been there, though that wasn’t actually true. I even convinced my best friend to let me have her leftover ride tickets, just in case. She gave me her map of the park, too, and I kept it stashed in my top desk drawer, right above a draft of a story I was writing about a mystery-solving gypsy. I was ready to hop on a plane at a moment’s notice. I never did get to use those tickets and the map disappeared amid a sea of messy drafts and unfinished math homework. Instead, my brothers and I somewhat-less-than-enthusiastically trekked our way from one historical landmark to another over the next decade. Have I mentioned my father was a history teacher? So instead of braving the perils of Space Mountain we tagged along on a tour of Independence Hall, where the founding fathers signed the Declaration of Independence in 1776. Or watched the recreation of the Battle of Concord. Or checked out the cannons and swords at Fort Ticonderoga. Disney World, with its promise of glamour and excitement, faded quietly into oblivion. I thought my family had the monopoly on The Most Boring Vacations Ever but as I got older our forays into the past started to interest me. At some point (well after my gypsy detective had retired) I started thinking about writing a story that would weave together the lives of two characters, one from the past and one from the present. Two years ago that morphed into Vertigo, my romantic suspense novel out this month from Wild Rose Press. Vertigo traces the lives of Blake Cartwright and Lucy Stone. Blake is a New York lawyer with the perfect life. She’s got a gorgeous apartment, a rich fiancé and a job at aprestigiouslaw firm, but she decides to give it all up to renovate a dilapidated lighthouse on the Maine coast. Lucy is the wife of a lighthouse keeper who lived at Eagle Point during the 1920’s. One stormy night she fell to her death from the tower and her husband disappeared. According to local legend, Lucy’s ghosts still haunts the tower, luring women to commit suicide on the rocky shore below. Blake soon finds herself at the center of not one but two mysteries: the mystery of local woman’s death and the mystery of what happened to Lucy. I don’t want to say too much because I’ll give away the plot, but as Blake pursues the truth she finds that both are inextricably linked. She also discovers strange parallels between her own life and Lucy’s. Did every woman go a little crazy when she hit thirty? Blake Cartwright stood in what passed for a driveway, staring at the ramshackle two-story cape she now owned. What had looked quaint yet spacious on the internet was dingy and run-down up close. The sunny blue skies of the photos were nowhere to be seen, even though it was the middle of July. Dark spruces surrounded the place, their pointy spires disappearing in a ghostly mist that hung over everything. The rocky coastline that had seemed stunning a month ago looked threatening and unfriendly now. As for the lighthouse, she didn’t even want to contemplate the amount of money it was going to take to make it presentable. She hadn’t been thinking. That was the problem. For twenty-nine years she had done things by the book and her life had been one long, picture-perfect Kodachrome moment. Up until six weeks ago she had the dream job, the dream apartment, the dream boyfriend. Then for the first time—after a teary night spent with her laptop and a couple of margaritas—she had trusted her emotions. For once she had allowed herself to stop planning and start imagining. She would open a thriving inn, one that would allow her to pursue her passion for cooking while freeing her from the insane hours she logged at her law firm. Even if she had to put some money into renovations, she could get the lighthouse for so little it would hardly dent her savings. And this, she thought as she stood staring at the white clapboard house with its chipping paint and sagging roof, was the result. 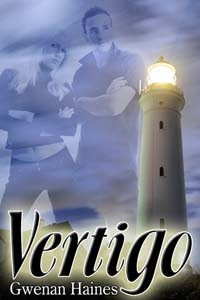 Gwenan will be giving away a digital or print copy of VERTIGO (winner's choice) to one lucky person leaving a comment or email entry. Vertigo sounds really interesting! Love the idea of the ghost and the life parallels! Vertigo has my interest. I would like to read more about what Lucy and Blake have in common even though they live century apart. This is also a very good mystery to be solve. I'm even thinking that Blake might be a reincarnation of Luck. I really am speculating of what could have happened to Lucy and now Blake has to solve her murder and the murder in her own timeline. Very very interesting... liking the sound of an old and new mystery tangled together... you have me curious about the characters... thanks for sharing! Romance, mystery and some history mixed in. This sounds like an interesting book! I must say that the historical landmarks would interest me much more then Disney World ever could. Good thing to, because I had my fair share of side trips with my parents. VERTIGO sounds wonderful. Don't give the plot away, because I do want to discover for myself.